Biosensors for Sustainable Food - New Opportunities and Technical Challenges addresses the challenges associated with sustaining the globally increasing demand for food that has been forecast for the next centuries and the immediate need for the food production system to adopt sustainable practices to protect the environment and human health. 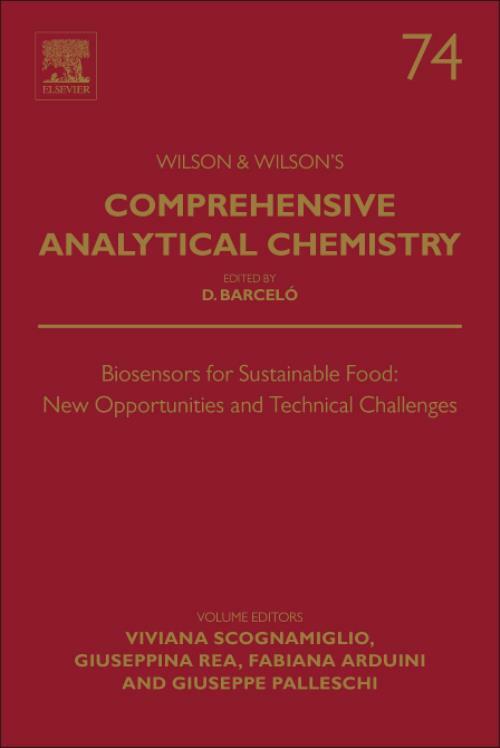 It provides a comprehensive overview of established, cutting-edge, and future trends in biosensor technology and its application in the agrifood sector. In particular, different biosensing advances are covered, outlining the newest research efforts in the cross-disciplines of chemistry, biology, and materials science with biosensing research, in order to develop novel detection principles, sensing mechanisms, and device engineering methods. Food production and consumption have a strong impact on the environment in terms of greenhouse gas emissions, water, and soil contamination, the reduction of arable land, water consumption, and many other factors, which in turn, negatively affect human health. These issues have consequences for economic development, too. To address these challenges, it is necessary for scientists with different expertise, policymakers, and economists work together to develop new smart technologies and introduce them to the market, along with adequate regulations. In this regard, a sustainable food production system can be thought of as a chain of procedures with a low impact on the environment that guarantees a secured supply of healthier and fortified food while supporting economic growth.